Gareth Edwards’ Godzilla may not be a perfect movie, the human component leaves much to be desired, but the rebooted creature feature is, however, an insane amount of fun. (And it was good enough to land Edwards a gig directing the first stand alone Star Wars movie.) The movie hits Blu-ray and DVD soon, and ahead of that release, Legendary has unveiled a new extended clip. Be warned, this is a version of the big climactic battle, so there are obviously SPOILERS if you haven’t seen Godzilla yet. Though some of the editing is a wee bit janky, this longer version captures what Godzilla does best, which is throwing a bunch of giant monsters into conflict with each other and letting them wrestle around, knocking down San Francisco buildings in the process. For all of its failings, when the King of the Monsters clashes with the monstrous MUTO creatures, it’s hard not to feel like a kid smashing your toys together on a playground. And luckily there’s not much time spent with the human characters. You touch base with Aaron Taylor-Johnson’s Ford Brody here, as well as his wife Elle (Elizabeth Olsen), but what you see is primarily them running from the destruction, so they’re not super annoying. This clip also contains one of the moments that made crowds and audiences in theaters roar with excitement and clap like crazy people. This is when Godzilla’s fiery atomic breath finally makes an appearance as he pries open one of the MUTO’s mouths and blasts its innards to a fried, crispy mess. It’s a good time. As much fun as Godzilla is, and as big a success as it was at the box office, it’s going to be a while before we see any more from the big guy. 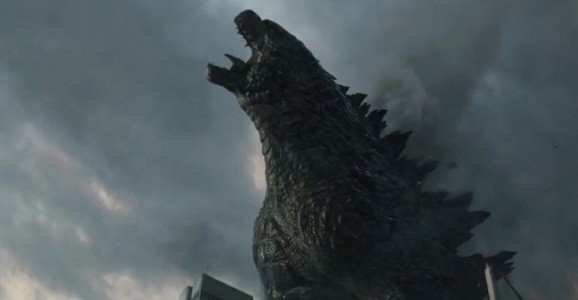 While Edwards is still definitely going to direct Godzilla 2, it won’t stomp into theaters until June 8, 2018. That should provide him with ample time to deliver his Star Wars movie, which will, according to reports and rumors, revolve around fan favorite bounty hunter Boba Fett. It’s also hard not to get excited about that. On the upside, while we’re waiting, we can daydream about a few of the other iconic monsters from the Godzilla universe that could make an appearance in the sequel. We’ve been promised that Mothra, King Ghidorah, and Rodan will all stop by for a visit, and while that is a totally awesome prospect, like we said, it’s still a long way off in the distance. Listen close and you can almost hear the thunder of the massive clash off in the distance. Until that day almost four years from now, we’ll have to satisfy ourselves with watching Godzilla on our TVs at home as it hits Blu-ray and DVD on September 16.